Cognitive impairment has a high prevalence in Schizophrenia and has been linked to functional outcome. To date statistically significant effects of medication on cognition in mood disorder trials and in schizophrenia do not necessarily translate to clinically meaningful effects. Apart trom it other potentials benefits like being less expensive, not being cause dependent and having no side etfect increases demands of non pharmacological programs. Keeping this in view following objectives were set for the study. Development of a cognitive remediation package and investigating the ctTicacy of that cognitive remediation program of neuropsychological deficits in terms of memory. 100 schizophrenic patients as per ICD 10 who came to Psychiatry OPD of Jawaharlal Nehru Medical College, Aligarh Muslim University, Aligarh, UP, India were recruited for the study. Patients were randomly allocated to experimental group and control group. Patients in experimental group were given cognitive remediation therapy for 3 months and patients of control group were on treatment as usual. Memory was assesses using PGI Memory scale at baseline, post treatment (3 months) and follow up (6 months). Participants in experimental group improved more than those in control group on cognitive fhnetioning post training with attenuation of some gains at the 6 months. Cognitive Impairment, Cognitive Remediation, Memory Enhancement, Schizophrenia. Addington, J., & Addington, D. (2002). Cognitive functioning in first-episode sch.izo'phxQnia.. Journal of Psychiatry and Neuroscience,27(3), 188. Arroll, B., Goodyear-Smith, F., Kerse, N., Hwang, M., Crengle, S., Gunn, J., & Sidhu, K. (2009). Prevalence of depression among Maori patients in Auckland general practice. Journal of Primary Health Care, 7(1), 26-29. Bell, M. D., & Bryson, G. (2001). Work rehabilitation in schizophrenia: Does cognitive impairment limit improYomQnC Schizophrenia Bulletin, 27(2), 269. 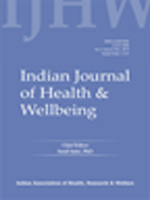 Bhatia, T., Agarwal, A., Shah, G., Wood, J., Richard, J., Gur, R. E., & Deshpande, S. N. (2012). Adjunctive cognitive remediation for schizophrenia using yoga: An open, non-randomisedtrial. ActaNeuropsychiatrica, 24(2), 91-100. Cavanaugh, J. C., Kramer, D. A., Sinnott, J. D., Camp, C. J., &Markley, R. P. (1985). On missing links and such: Interfaces between cognitive research and everyday problemsolving. Human Development, 28(3), 146-168. Drake, R. J., Day, C. J., Picucci, R., Warburton, J., Larkin, W., Husain, N., & Marshall, M. (2014). A naturalistic, randomized, controlled trial combining cognitive remediation with cognitive behavioural therapy after first-episode non-affective psychosis. Psychological Medicine, 44(9), 1889-1899. D'souza, D. C., Radhakrishnan, R., Perry, E., Bhakta, S., Singh, N. M., Yadav, R., & Bell, M. (2013). Feasibility, safety, and efficacy of the combination of D-serine and computerized cognitive retraining in schizophrenia: An international collaborative pilot study. Neuropsychopharmacology, 38(3), 492-503. Elgamal, S., Mckinnon, M. C., Ramakrishnan, K., Joffe, R. T., & Macqueen, G. L. E. N. D. A. (2007). Successful computer-assisted cognitive remediation therapy in patients with unipolar depression: A proof of principle study. Psychological Medicine, 37(9), 1229-1238. Elvevag,B.,& Goldberg, T. E. (2000). Cognitive impairment in schizophrenia is the core of the disorder. Critical Reviews™ in Neurobiology, 74(1), 2. Fujii,D.E. (Ed). (2011). Theneuropsychology of Asian Americans. Psychology Press. Galletly, C. (2009). Recent advances in treating cognitive impairment in schizophrenia. Psychopharmacology, 202(-3), 259-273. Goldman, M. S. (1990). Experience-dependent neuropsychological recovery and the treatment of chronic a3cohosm..Neuropsychology Review, 7(1), 75-101. Gold, J. M., Randolph, C., Carpenter, C. J., Goldberg, T. E., & Weinberger, D. R. (1992). Forms of memory failure in schizophrenia. Journal of Abnormal Psychology, 101(3), 487-494. Gourovitch, M. L., Goldberg, T. E., & Weinberger, D. R. (1996). Verbal fluency deficits in patizents with schizophrenia: Semantic fluency is differentially impaired as compared with phonologic fluency. Neuropsychology, 10(4), 573. Hegde, S., Rao, S. L.,Raguram, A., & Gangadhar,B. N. (2012). Addition of home-based cognitive retraining to treatment as usual in first episode schizophrenia patients: A randomized controlled study. Indian .Journal of Psychiatry, 54(1), 15. Heinrichs, R. W., & Zakzanis, K. K. (1998). Neurocognitive deficit in schizophrenia: A quantitative review of the evidence. Neuropsychology, 12(3), 426. Harvey, P. D. (Ed.). (2013). Cognitive impairment in schizophrenia: Characteristics, assessment and treatment. Cambridge University Press. Lynge, I., & Jacobsen, J. (1995). Schizophrenia in Greenland: A follow-up study. Acta Psychiatrica Scandinavica, 91 (6),414-422. MacCabe, J. H., Lambe, M. P., Cnattingius, S., Torrang, A., Bjork, C., Sham, P. C., & Hultman, C. M. (2008). Scholastic achievement at age 16 and risk of schizophrenia and other psychoses: Anational cohort study. Psychological Medicine, 55(8), 11331140. McGurk, S. R., Twamley, E. W., Sitzer, D. I., McHugo, G. J., & Mueser, K. T. (2007). A meta-analysis of cognitive remediation in schizophrenia. American Journal of Psychiatry, 164(12), 1791-1802. Medalia, A., & Choi, J. (2009). Cognitive remediation in schizophrenia. Neuropsychology Review, 19(3), 353. McKenna, P. J. (1991). Memory, knowledge and delusions. The British Journal of Psychiatry, 759(14), 36-41. Paulsen, J. S., Heaton, R. K., Sadek, J. R., Perry, W.,Delis, D. C., Braff, D., & Jeste,D. V. (1995). The nature of learning and memory impairments in schizophrenia. Journal of the International Neuropsychological Society, 7(1), 88-99. Pershad, D., & Verma, S. K. (1990). Handbook of PGI battery of brain dysfunction (PGl-'BBD). National Psychological Corporation, 4(230), 70-111. Pershad, D., &Wig,N. (1988). Handbookfor PGI Memory Scale Clinical Test. National Psychological Corporation, Agra. Patten, B. M. (1990). The history of memory arts. Neurology, 40(2), 346-346. Rector, N. A., Stolar, N., & Grant, P. (2011). Schizophrenia: Cognitive theory, research, andtherap-y. GuilfordPress. Reichenberg, A., & Harvey, P. D. (2007). Neuropsychological impairments in schizophrenia: Integration of performance-based and brain imaging findings. Psychological Bulletin, 133(5), 833. Randolph, C., Goldberg, T. E., & Weinberger, D. R. (1993). The neuropsychology of schizophrenia. JournalofAbnormal Psychology, 101,487-494. Seidman, L. J., Biederman, J., Faraone, S. V., Weber, W., & Ouellette, C. (1997). Toward defining a neuropsychology of attention deficit-hyperactivity disorder: Performance of children and adolescents from a large clinically referred sample. Journal of Consulting and Clinical Psychology, 65(1), 150 Sulehri, M. A., Dogar, I. A., Sohail, H., Mehdi, Z., Azam, M., Niaz, O., & Iqbal, Z. (2010). Prevalence of depression among tuberculosis patients. APMC, 4(2), 133137. Saykin, A. J., Shtasel, D. L., Gur,R. E.,Kester, D. B.,Mozley, L. H., Stafiniak, P., & Gur, R. C. (1994). Neuropsychological deficits in neuroleptic naive patients with first- episode schizophrenia. Archives of General Psychiatry, 57(2), 124-131. Tom Novack, PhD and Jacqueline Blankenship, MCD, CCC-SLP (2002). https://www.uab.edu/medicine/tbi/uab-tbi-information-network/uab-tbims-home-based-cognitive-stimulation-activities. Woodberry, K. A., Giuliano, A. J., & Seidman, L. J. (2008). Premorbid IQ in schizophrenia: A meta-analytic review. American Journal of Psychiatry, 165(5), 579-587.